When I was in grade school we had Spanish class once a week. I took three years of Spanish in high school and then switched to French in college. I know enough Spanish to ask where the bathroom is, but whether or not I understand the answer is another matter. Oh well, at least I took away one thing from all those years of Spanish class - these tissue paper flowers! I made these all the time as a kid. They're really that simple! All you need is some colored tissue paper and a bunch of green pipe cleaners. You can buy a multi color pack of tissue paper, but I just used tissue paper I had saved from our wedding and Abe's baby shower. 2. Stack tissue paper squares and fold accordion-style. I did a 1½ inch fold on this one. 3. Wrap a pipe cleaner around the center of the folded paper and twist to secure. 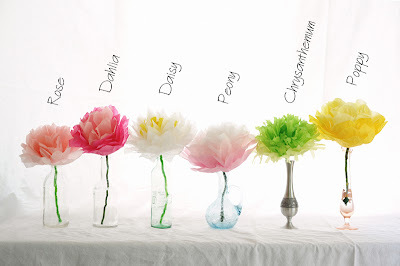 Just make sure your top/interior petal colors are facing up! ...and carefully separate the layers of paper. 6. Repeat on the other side and fluff the petals to fill in any empty spots. 7. Display in a vase or wrap a bunch of stems together to make a bouquet. I found the flower heads were too heavy to be supported by a pipe cleaner so they just flopped over in a large vase. Wrapping the stems around a chopstick should fix the problem, or just put them in a bottle or bud vase with a narrow neck. I experimented with a bunch of different flower shapes. Scroll down to see the folding and cutting instructions for each one. To make a chrysanthemum, follow the instructions above. To make a dahlia, use 4 squares of hot pink tissue and 2 squares of pink. Make 1½ inch folds and cut the ends to a point. To make a peony, use 2 squares each of pink and pale pink, and 4 squares of white. Make 2 inch folds and cut rounded ends. To make a rose, use 2 squares pale peach and 4 squares peach . Make 1½ inch folds and cut rounded ends. To make a daisy, use 6 squares of white tissue and 2 squares of yellow. Make 1½ inch folds and cut the ends to a point. For the poppy, use 4 squares deep yellow and 2 squares pale yellow. (For an oriental poppy, use 4 squares red for the petals and 2 squares black for the center.) Make 3 inch folds and cut rounded ends. Experimenting with different colors is part of the fun, so feel free to just use what you have! There you have it, a sweet and simple decoration for Cinco de Mayo, Mother's Day, weddings, birthdays...anything really. Enjoy! I love love love these. I loved them when you pinned them, and I love that you've made them. They are on my to do list for sure. These are great! I love all of your tutorials!! Can I ask where you got your dress? I love the pattern! That dress is from Old Navy. It may still be online but most stores are out of it. Just in time! Our after school students have minimum days all next week because of State Testing. These flowers will make perfect Mother's Day presents. Thank you. Vos fleurs sont magnifiques, merci ! merci et bravo- thank you for the turorial! Love it. I would like to pin it, but since you don't have a pinterest button, was wondering if that was okay with you? My daughter will love doing these! www.ahrart.blogspot.com. You inspired me to make some out of newspaper. Did they work with newspaper? This is such a cute tutorial. I would love for you to link it up to my party tomorrow, starting at 6:30pm. ADORABLE! I use 18 gauge wire (sewing or craft store has packages of 16 for about a dollar). One of these is light weight enough to use around the paper ti twist. Then I place the pipe cleaner up the paper area so it disappears when I pull the paper up around it , then entwine it around the wire stem. The wire is sturdy enough to act as a stem and the pipe cleaner gave it the green & thicker appearance. I also use pinking shears to trim all edges of my paper before folding it. Still round the tips. I twisted 4-5 of these (varying sizes and colors) into bouquets. Each went into an empty spaghetti sauce jar wrapped with scrapbook papers and tied with a raffia bow. Four went down the long tables for a family party with a couple scattered around the house for pops of color. I had some tumbled green aqua glass stones for flower arranging and I scattered a dozen in the bottom of each vase for weight & water effect. Family loved the simple & colorful decorations. I sent some home with people , and gave a few to some little neighbor girls. I folded and wired several dozen and then just worked the tissue a half dozen a night while watching tv each night. Fun! Genius! I always have leftover tissue and can't stand to throw it away. Will maybe iron it flat again or some biig dahlias. These look great! I have a question - in what order do you layer the different colours? The colors you want on the inside of the flower should be facing up when you attach the stem. The outer colors should be facing down. See step 3. Wonderful! I did this long ago, but some more different. I also made a small vase from a toiletpapertube and a piece of cardboard to put the flowers in. But this looks so easy, I want to try it again. Thank you for sharing. So so pretty. My daughter is going to love these! thank you so much for your inspiring tutorial!!! ouhhh!! I LOVE this!! so cute. I will be trying this soon - maybe in some fall colors! 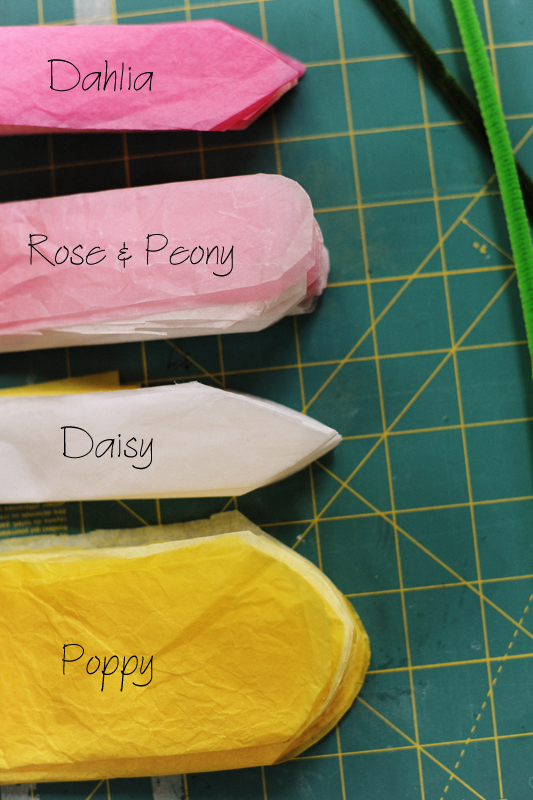 This is a great idea for making flowers, Little girls will want to try this, so cool, Thank you! Michelle, I pinned your tutorial on my pinterest board many, many, many moons ago. I decided to use my Pinterest boards for inspiration for my own craftinginstead of just having pretty things that other's have made, to look at. I've linked your post and credited your tutorial, and used it to make my very own Peony :) Beautiful might I add, and so easy to do. Thank you for the lovely pictures of how to make these. Your post was a perfect resource to show what we did to help a friend. Thank you! This is an easy tutorial. Thanks! I made giant tissue paper flowers for my son's 1st birthday. I made my flowers a bit differently (more sheets and used the entire sheet instead of cutting into a square) but I followed your instructions for the different cuts to make different types of flowers. I made a tutorial on how to make DIY Giant Tissue Paper Flowers on my blog and I lined to your post for how to cut the tissue paper for different flowers. I'd love for you to take a peek if you have a minute. Thank you so much for this idea. I used it for teacher appreciation week. Wonderful and simple and fast idea for decorations. I am making some now for our upcoming party in July. I used two pipe cleaners instead of one. Flower still sits a bit wobbly on the stem, but less so than with one pipe cleaner. Thank you for sharing your ideas. Muchas gracias por la idea, es genial! Hi, Michelle! Was looking to add a pop of color to my living room, wanted flowers, and found you. Couldn't decide which one I wanted - so made them all!!!!!!! Now I can't decide which one I like the best - guess I'll have to use them all together! Thanks for all the fun - it's so nice to add pretty things to your home knowing that YOU made them yourself, and that it's so affordable! Am looking forward to more of your DIYs! Beautiful! Walmart carries a pack of 60 6" wired wooden floral picks for under $3. Sturdier than pipe cleaners. These are so pretty! I just love them. I'm going to try my hand at the daisies. My mom's birthday is coming up and they are her favorite flower. I think she will love them too! Thank you for the wonderful day.